eCite - A prey-related shift in the abundance of small pelagic fish in eastern Tasmania? 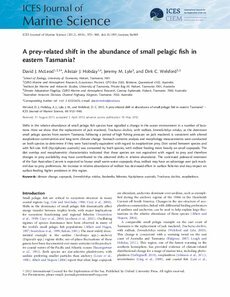 A prey-related shift in the abundance of small pelagic fish in eastern Tasmania? Shifts in the relative abundance of small pelagic fish species have signalled a change in the ocean environment in a number of locations. Here we show that the replacement of jack mackerel, Trachurus declivis, with redbait, Emmelichthys nitidus, as the dominant small pelagic species from eastern Tasmania, following a period of high fishing pressure on jack mackerel, is consistent with altered zooplankton communities and long-term climate change. Stomach contents analysis and morphology measurements were conducted on both species to determine if they were functionally equivalent with regard to zooplankton prey. Diet varied between species and with fish size. Krill (Nyctiphanes australis) was consumed by both species, with redbait feeding more heavily on small copepods. The diet overlap and morphometric characteristics indicated that these species are not equivalent with regard to prey and therefore changes in prey availability may have contributed to the observed shifts in relative abundance. The continued poleward extension of the East Australian Current is expected to favour small warm-water copepods; thus, redbait may have an advantage over jack mackerel due to prey preferences. An increase in relative abundance of redbait has decreased effort in surface fisheries and may impact on surface-feeding higher predators in this region.